Islamic leaders celebrated Valentine’s Day again this year by denouncing the holiday as anti-Islamic and calling for a “Modesty Day” instead that celebrates such items as burkas and veils. Students clashed today in Peshawar as dozens of liberal students sought to celebrate the holiday and defy orders from religious leaders to boycott the holiday. The result was an exchange of rocks and bricks between the pro-Valentine and anti-Valentine protesters. At least one student was shot and wounded. In Indonesia, warnings were issued that celebration of the holiday was an offense of Islam. In Malasysia religious monitors have been patrolling the streets looking for unIslamic practices. Valentine’s Day has been declared haram, or forbidden. We have previously discussed the opposition to the holiday from Islamic clerics. The latest clash occurred at the University of Peshawar when the rally in favor of the holiday was met by anti-holiday protesters. Some fired shots into the air. Many in Pakistan celebrate the holiday in private to avoid attacks. 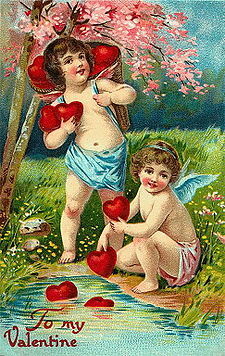 Saint Valentines in whose memory this day is observed is popularly believed to have been imprisoned for performing marriages of those soldiers who were forbidden to marry by the then Roman Empire. He eventually died in jail. If I were to celebrate his memory how can the same act be deemed un-Islamic? Marriage is encouraged under all school of thoughts of Islam and no group of Individuals belonging to any profession be it the army or be it muftis or mullahs are forbidden from getting married under Islam. Now, I am sorry if Saint Valentine did not use to read the Nikah Khutba, since Islam was introduced much after he passed away. . . .
Perhaps we should rebrand Valentine’s day as Waris Shah day or Shah Abdul Latif Bhitai day to make it more acceptable. It is an odd thing to rage against a holiday committed to love and relationships. Ironically, the true meaning of the holiday is probably best understood in countries like Pakistan where couples defy the government and religious orthodoxy to celebrate or declare their love. While many have denounced the holiday as cheesy and over-marketed, stories like these make me value the holiday a bit more. As for me, I just dug out the driveway (for a second time after McLean plowed a wall of ice in front of my recently cleaned driveway) and I am now heading out for flowers for Leslie. I hope everyone has a wonderful and a safe holiday. To those young people in Pakistan, history has shown that the bounds of human love and affection are far more lasting than government censorship or harassment. It finds a way like water to undermine the strongest walls. So Happy Valentine’s Day to all, even to those romance-challenged clerics who would apparently would prefer a dose of Ebola over a card of affection. Listening to your comments of the last few weeks with regard to president Obama I am scared for our nation. The senate appears to do nothing to control this man, in fact most of them on the left that hold an elected office seem to urge the president on to keep using executive orders. At some point this madness has to stop. I never wanted the military to ever get involved in the internal affairs for the United States, but now I see no other way out of this mess. In addition to what Mike A said up-thread about Huntington’s book, which was written in 1957, let me say that Huntington predicted exactly what has happened. When he wrote the book the military was “at each others throats” arguing who should get what amount of the taxpayer dollar, which weakened their political power vis-a-vis the civilian government. Huntington predicted that if that were to change somehow, and the military unified within itself, they would increase their political power vis-a-vis the civilian government. They are the top political power now (A Tale of Coup Cities – 9) and are weakening the U.S. Constitutional form of government. Send no Valentines to the military NSA. To second po@minutebol’s point, I have noticed a running theme regarding Islam when it comes to this blog. While I would not deny that portions of the Islamic world have significant issues with fanaticism, to say the least, I feel there’s a fine line between pointing that out and as Glenn Greenwald would say, scapegoating Muslims or Islam as the biggest worldwide threat to civilization. Regarding Valentine’s Day, I read an article the other day about fundamentalist Hindus attacking young lovers in Gujarat. Another example: There was a posting on this blog about the anti-gay law in Nigeria that focused on disgusting, homophobic statements from northern Islamic clerics. The post did not mention the fact that the Nigerian President who signed the law is a southern Christian and the legislature that passed the law is mostly evenly split between Christians and Muslims. it should also be mentioned, that as in Uganda, a lot of the anti-gay government initiatives we are seeing in Africa were inspired by Christian evangelical groups in the west. Of course, we should not stick our head in the sand about regressive trends in the Islamic world, whether its terrorism or radical illiberalism. For example, I agree with the professor’s critique of anti-blasphemy initiatives at the UN. However, I think you can do that without singling out Muslims to the extent of ignoring intolerance in other religious communities. We all could also avoid generalizing about a 1 billion plus community spread over 40-50 nations where they are the majority, not to mention the countless others where they are sizeable minorities. Thank you, Mimi V for framing so eloquently and effectively what has been my running battle on this blog. You need to read Samuel Huntington’s “The Soldier and the State” and get those crazy military coup thoughts out of your mind.